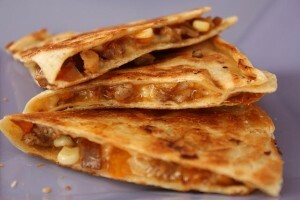 Quesadillas can be healthy especially if you stuff them with lots of veggies, lean meat, and low-fat cheese. That’s exactly what we do with this recipe. To increase the fiber even more, you can use whole-wheat flour tortillas or even toss in a handful of beans; let your family decide which kind. SPECIAL OFFER: SchoolFamily.com readers can purchase No Whine With Dinner at 30 percent off the list price, and get free shipping, by ordering the book here and using this promo code: FS2011. Heat 1 tablespoon of the oil in a large nonstick skillet over medium-high heat. Add the bell pepper and cook, stirring frequently, until softened, about 7 minutes. Stir in the sausage, reduce the heat to medium, and cook until heated through, 2 to 3 minutes. In a bowl, stir together the cooked bell pepper and sausage, cheese, corn kernels, and barbecue sauce. Spread the mixture evenly over half of each tortilla. Fold over, press down gently, and set aside. Heat 1 teaspoon of the oil in the skillet over medium-high heat (you may want to wipe out the skillet first). Add 2 of the quesadillas and cook, pressing down occasionally with a spatula, until the bottoms are crisp and golden, about 3 minutes. Flip them, and cook until the other sides are golden, about 2 minutes. Repeat with the remaining oil and quesadillas. Cut into halves or quarters and serve.